All the marzipan orange cakes, which I made recently disappeared as dew for sunshine at a tea break at work Marzipan orange cakes. As I still have a marzipan left from Christmas, I decided to make a new portion of these cakes, but this time with a smaller twist to it. 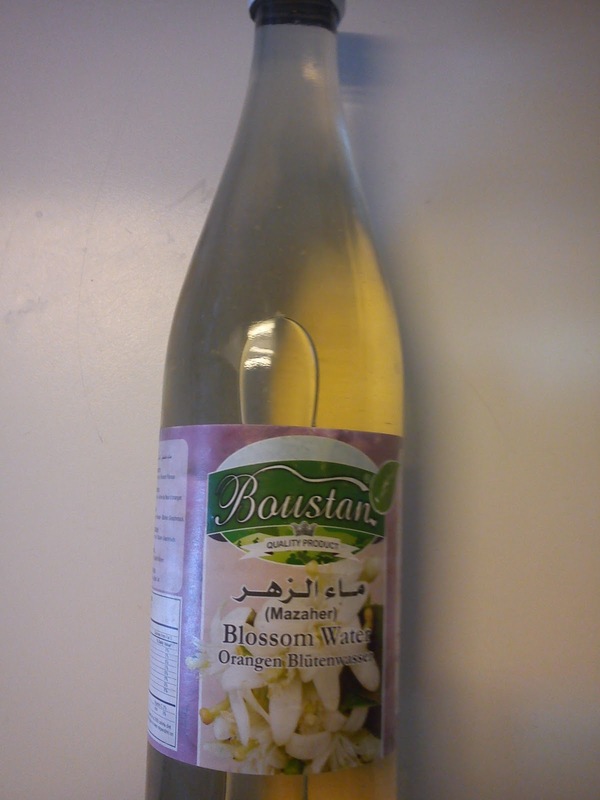 In one of the local ethnic fruit and vegetable shops I found a bottle of orange flower extract. 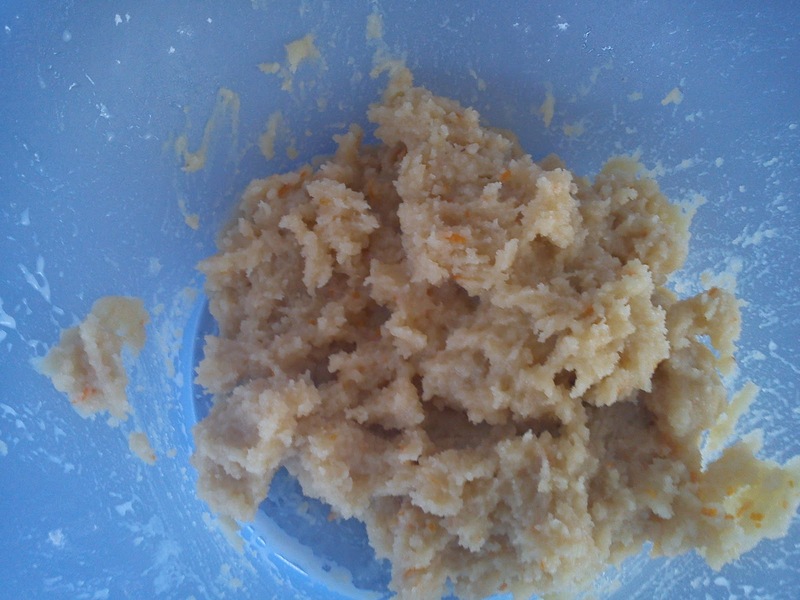 So I decided to add some of this extract to the marzipan orange cakes. Uuhmmm :-)))The orange flower extract gives a very nice twist to wonderful marzipan cakes. 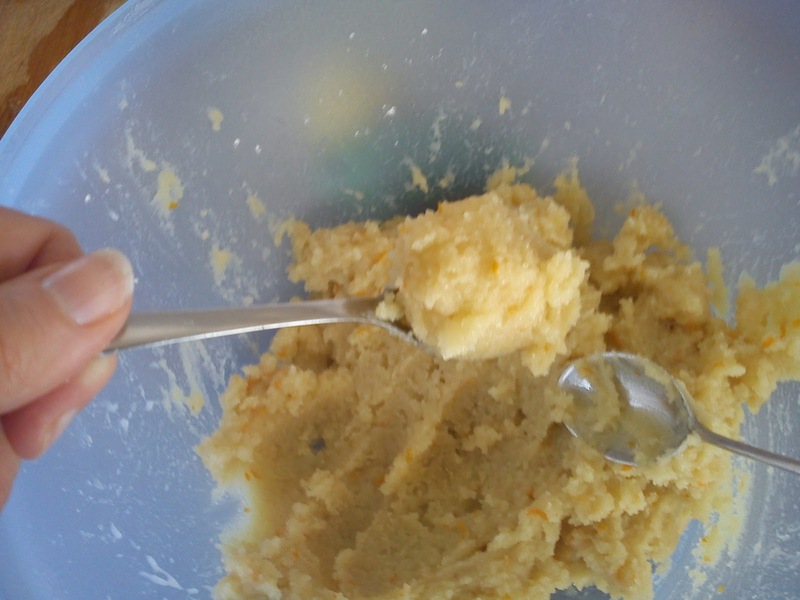 Lets see how long the shelf-life will be for this new portion of marzipan orange cakes ??? I have to question if, they will last for one month. 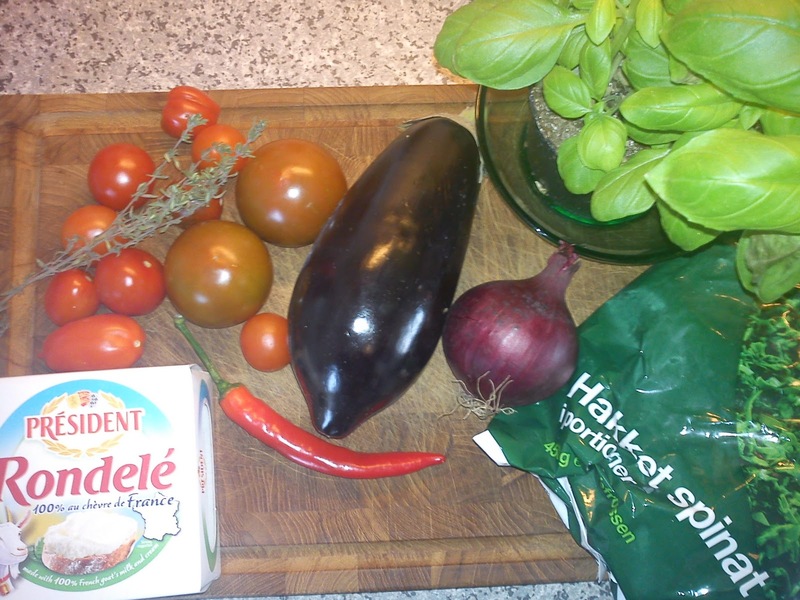 Knead all the ingredients together with your hands . Use teaspoons for placing the marzipan mass on baking paper as small tops. I never use silicone baking paper, when I am baking marzipan, as it quiet tricky to get the marzipan off after baking. 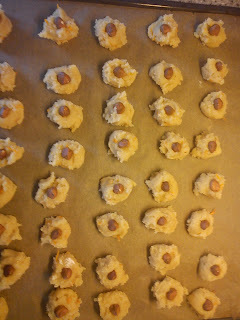 Place a hazelnut kernel in each marzipan top. 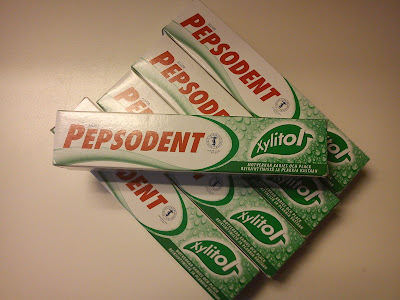 During my business trip to Finland I used the opportunity to fill my suitcase with a few interesting thing, which you more or less only can buy in Finland. First point on my shopping list was tooth paste with a high level of xylitol, which will reduce your risk for tooth decay. 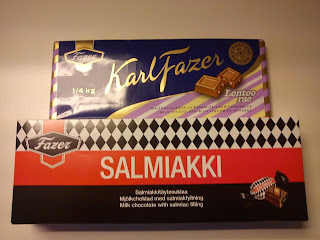 So after being "good" to my teeth, I could with a relaxed mind buy Finnish style candy !!!!!! 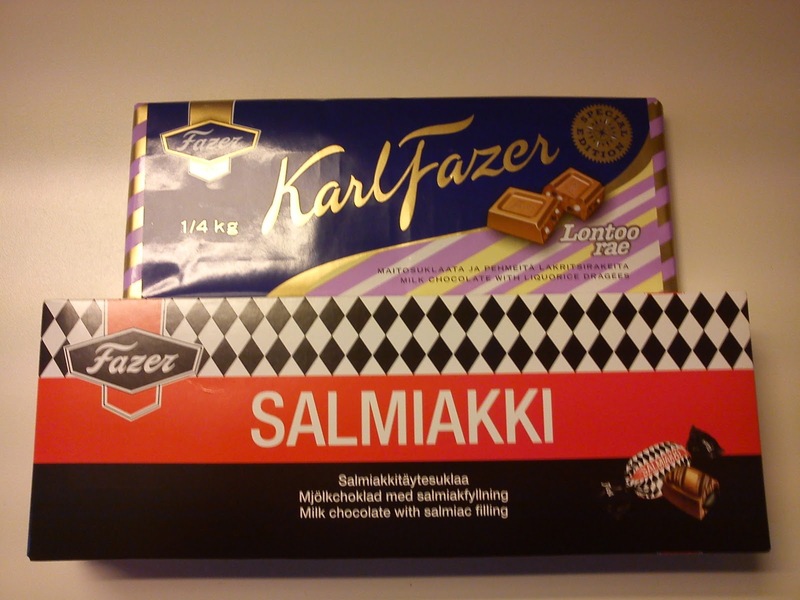 So the second point was different type of milk chocolate with liquorice. The first type is milk chocolate with liquorice drages. 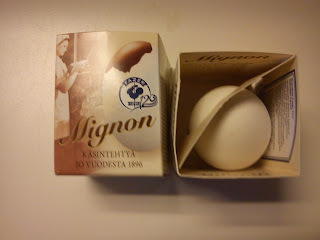 The second chocolate is Salmiakki, which is milk chocolate with a fluid salmiac filling inside. I am just "crazy" with these liquorice chocolates. The final thing on my shopping list is Finnish Easter egg. These Easter egg is real eggs, where the egg shell is filled with nougat chocolate with almonds and nuts. According to the "locals", you should put the Easter egg in the refrigerator, before you remove the egg shell, so your fingers do not become messy. I enjoy to eat at Toscanini, when I am on business trips to Helsinki. This restaurant is located at the hotel (KlausK), where I usual stay, so it is very easy just to go down and eat there. However, many locals are eating in the restaurant as well. So it is recommended to book a table, even on a "normal" working day !!! I started with a glass of sparkling wine as usual, as I have to live up to my reputation of being a champagne girl :-)) As starter I had a lovely salad of various salad leafs, pine kernels, apple vinaigrette and Parmesan cheese. 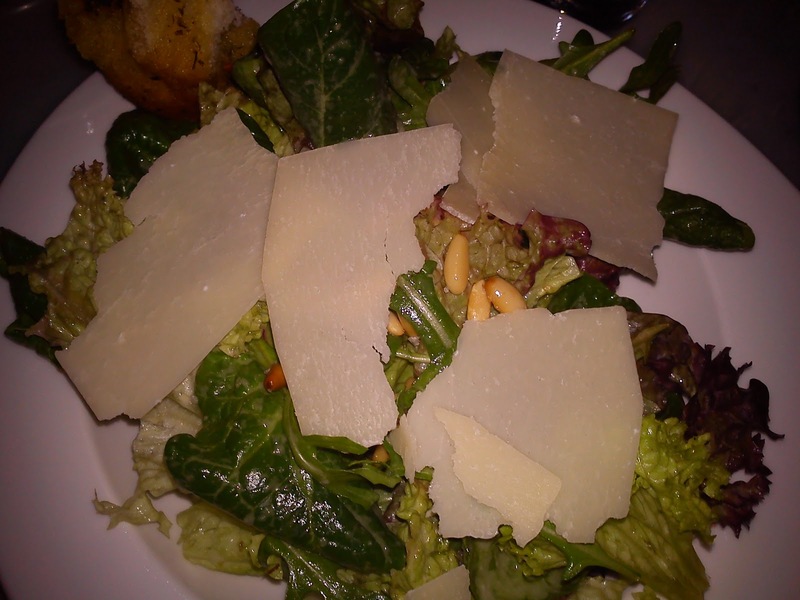 I could have used some more pine kernels in the salad. 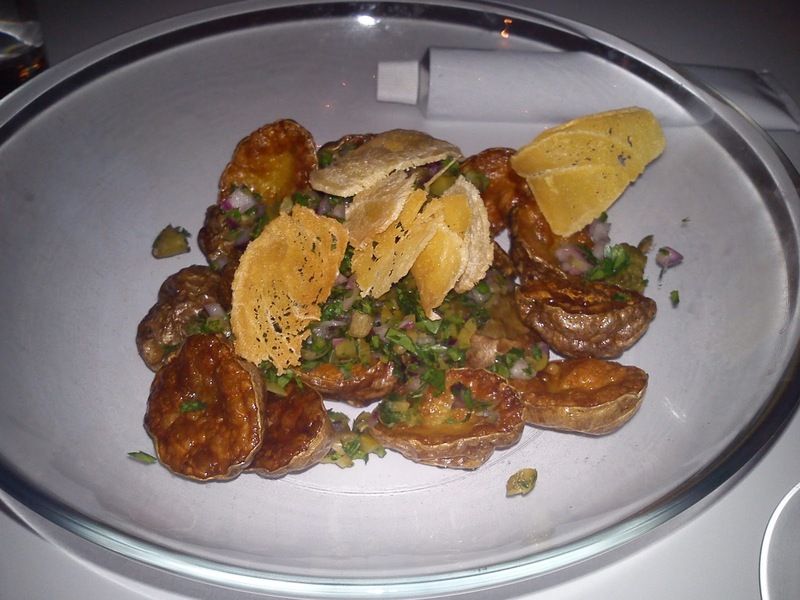 Very refreshing and light as a starter. 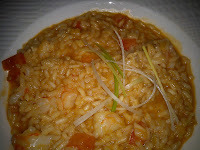 My main course was a risotto with tiger prawns, lobster butter and tomato. It had a very rich taste and smell of lobster, uuhmmm :-) I would have liked to have been served some freshly grated Parmesan cheese on top of the risotto !! As dessert I have tiramisu (another usual dessert, when I am eating Italian style). 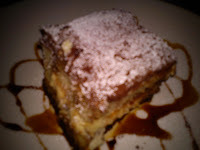 It was freshly make, very creamy, perfect portion size and very dominating coffee taste. To dominating in my opinion, as I am a tea lover, and do not drink coffee at all. 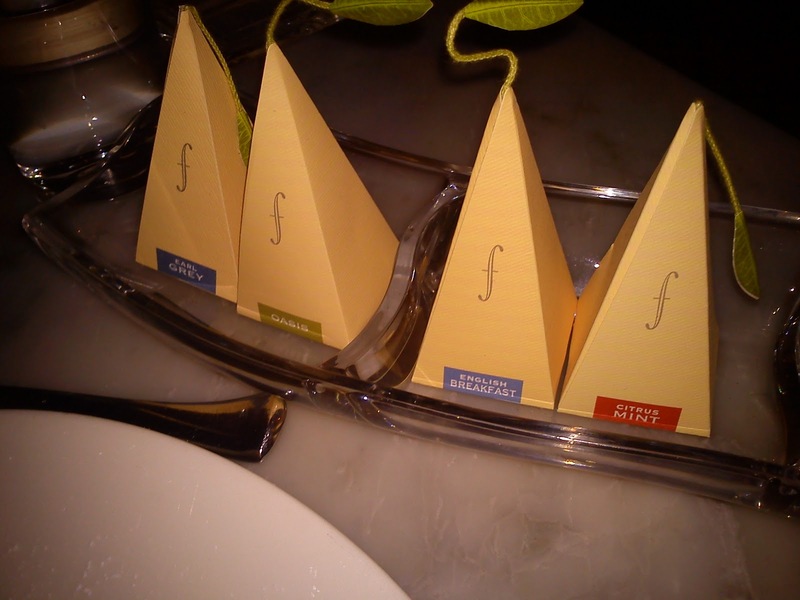 All in all an nice meal and very good service. 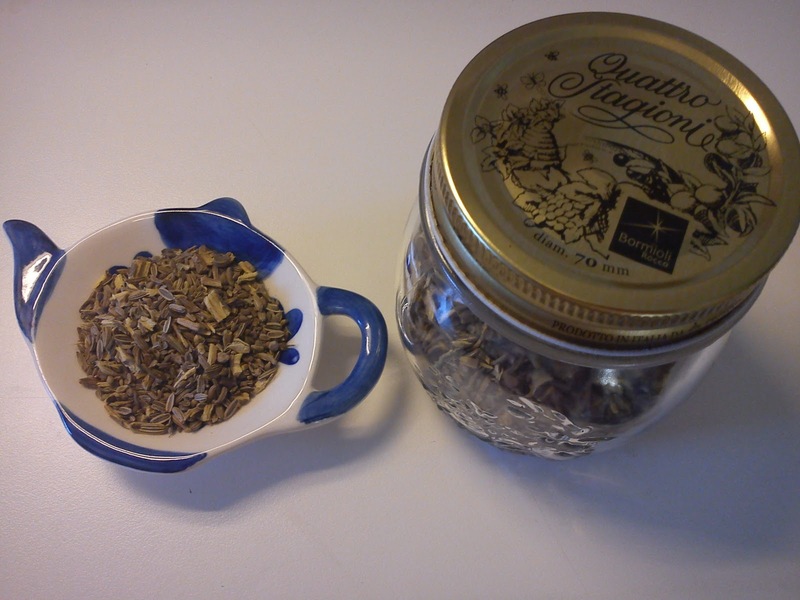 And finally my neighbour lent me a helping hand, as I did not have any whole cloves in my kitchen cupboard. 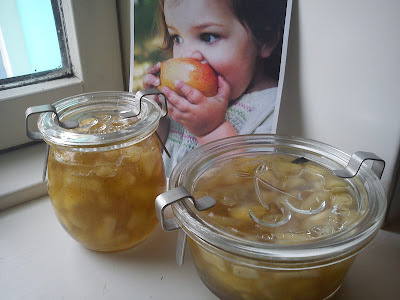 I will use this apple jam either for plain yogurt and/or bread with or without cheese. Peel the apples and cut the apple into 1 x 1 cm pieces. The peel from the apple will not be so appealing, while eating the final jam. Peel the lemon - without the white part of the peel - cut it in into small pieces. As well cut the fruit part of the lemon into small pieces. 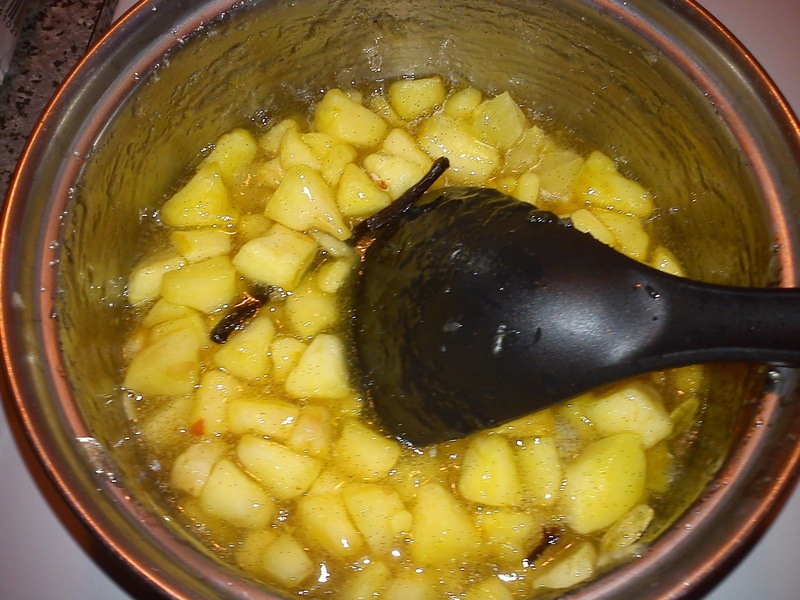 Put the apple into a cooking pot together with the water. 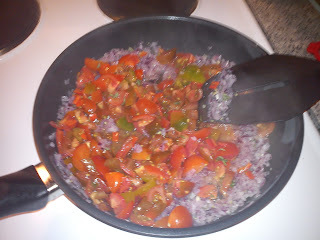 Add the gelling powder and agitate. 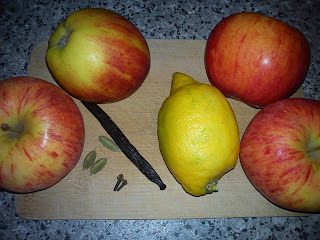 Also add the lemon peel & fruit, cardamon kernel, cloves, vanilla corn and vanilla pod. 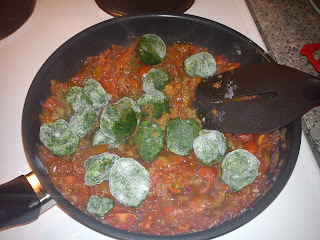 Bring the fruit to the boiling point and let it boil until the apple is "al dente" in the bite. I decided not the remove the vanilla pod, cardamon kernels and whole cloves from the jam, before filling the jam into glass jar, as I want to a "stronger" taste of these spices in the jam. 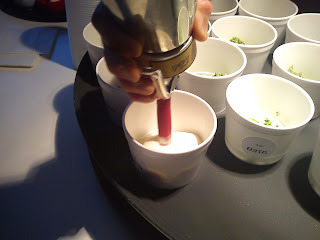 In connection with the cheese tapas we were served this very nice tea infusion of fennel, anise and liquorice root. 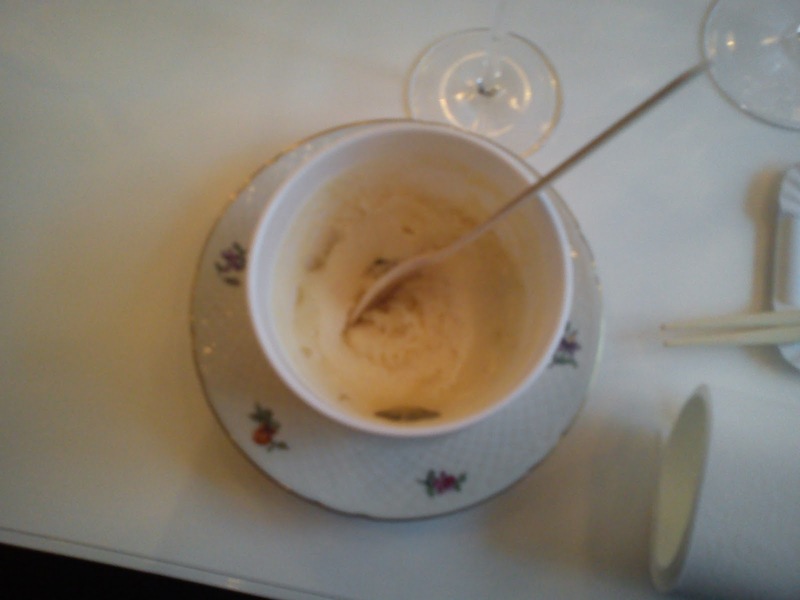 I managed to get a portion of this tea home with me for my own tea cup/pot. 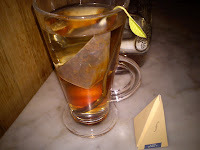 This tea need to infuse for 10 minutes before drinking it. 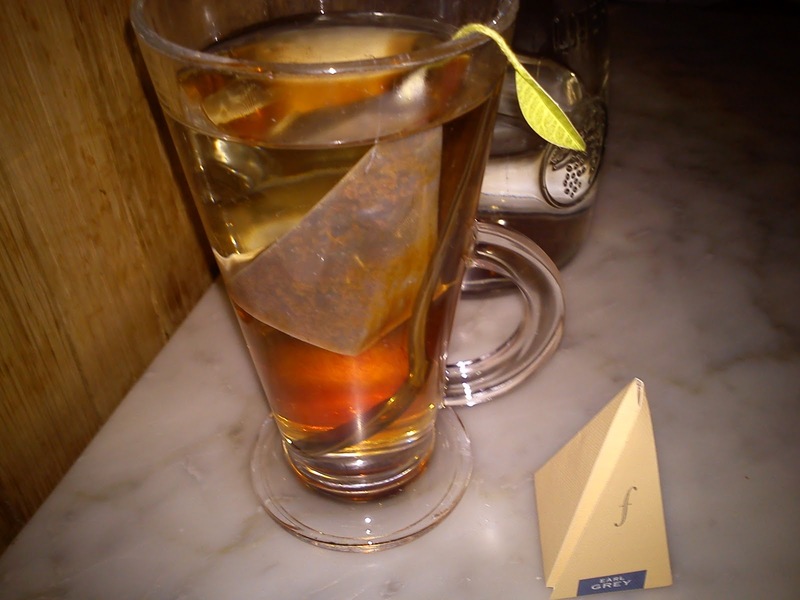 It has such a sweet taste on it's own, that I have no need for adding sugar to the tea. 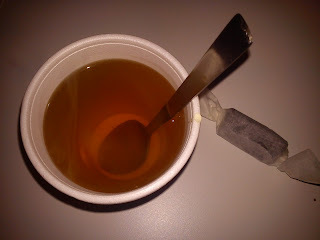 I am normally drinking my tea with sugar in order to boost the flavour. 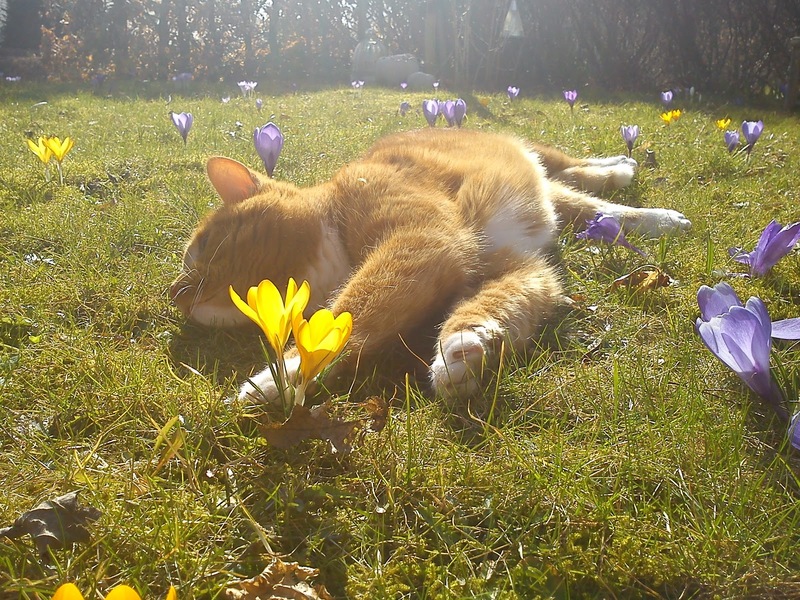 I spend some time in my garden this afternoon enjoying the sunshine, while I was doing this year very first work in my little garden. I was cutting down the perennials, as garden waste will be collected tomorrow. 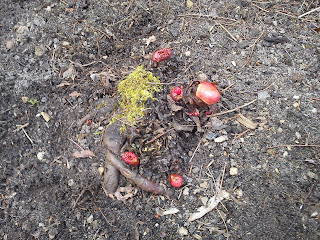 At the same time I took good look at, how my rhubarbs are doing after the winter. They are just starting to pop their heads above the ground. 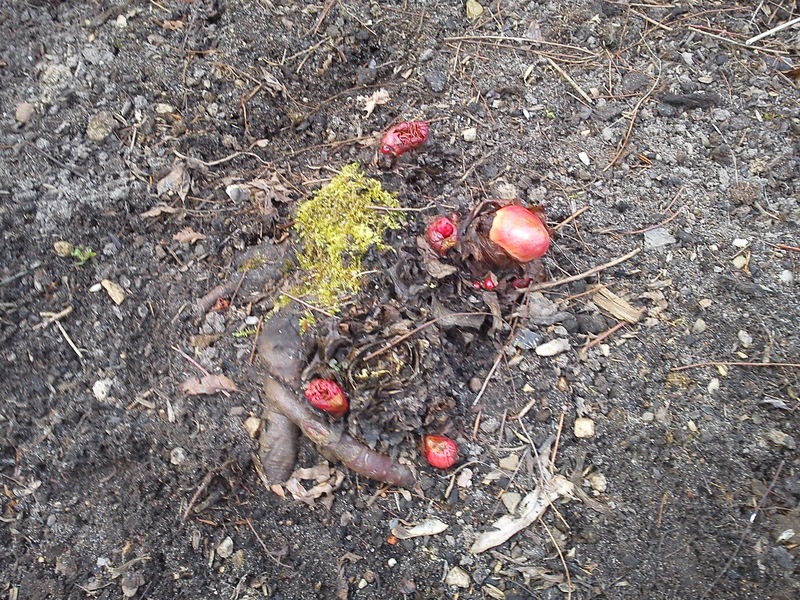 I am big fan of using rhubarb in my kitchen :-)) And I have little collection of various rhubarb, which I have got from work colleagues and family. 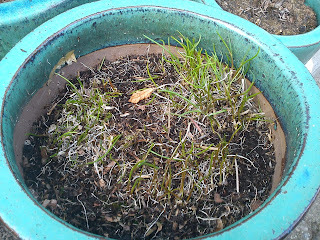 The first herb in form of chives has also started to grow again after winter. I have to remember to start watering my herb pots, as it quiet dry right now. Now I have to see, which of the herbs, who have survived the very cold winter. 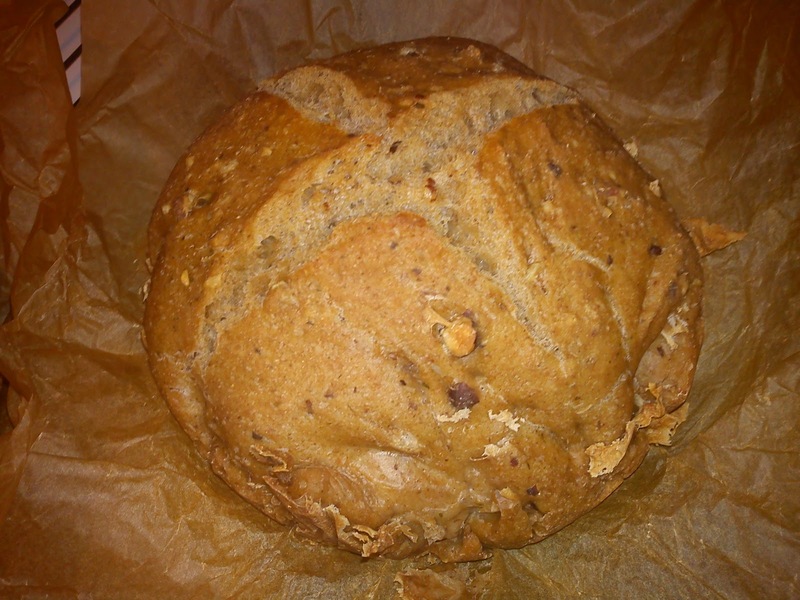 As I was making the dough for this walnut bread at the same time, as I was making the dough for the Kokottebread, I was making the mistake of adding the grated nuts before kneading TWICE !!!! 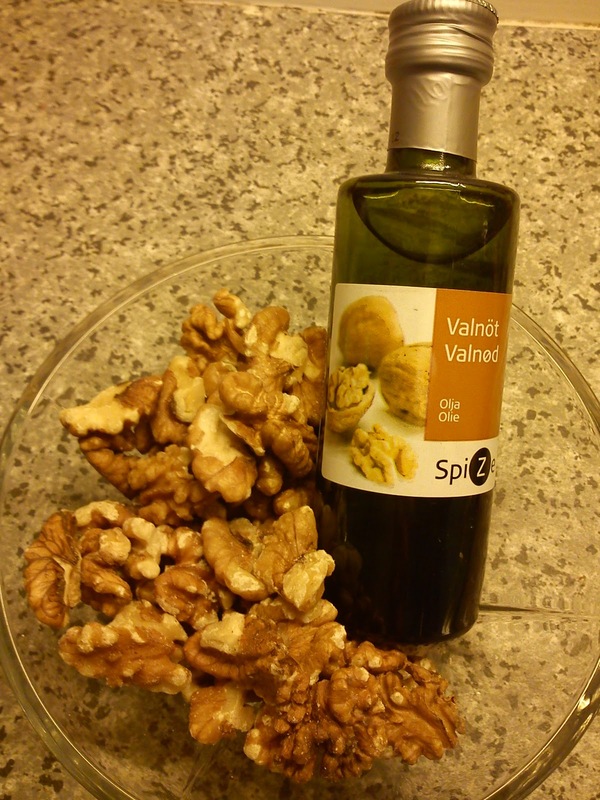 So while vacuum cleaning the kitchen floor, the vacuum cleaner was "eating" both hazelnuts and walnuts. I hope it is not suffering from nut allergy. 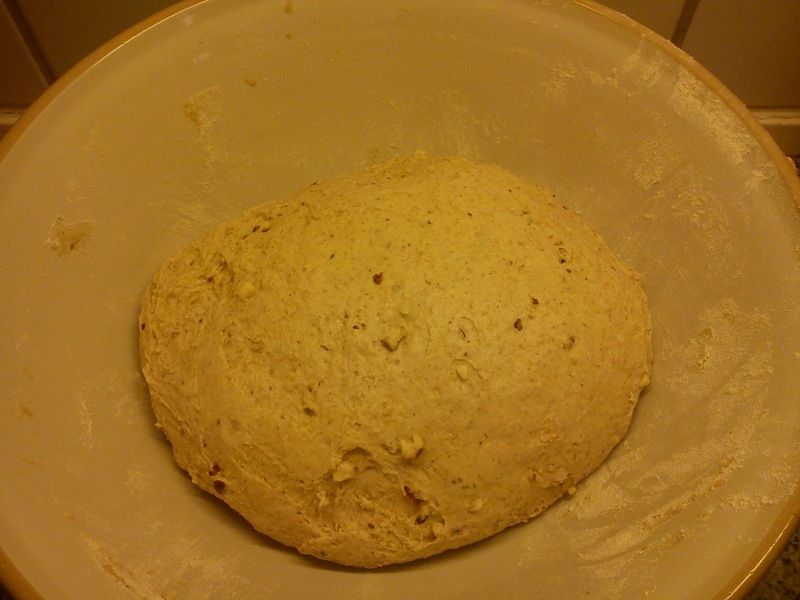 So another time I will first add the walnut after kneading, so they do not pop out of the the dough during kneading. 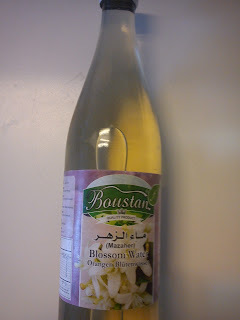 Instead of barley malt syrup I decided to use "normal" sugar syrup instead of. I have another recipe from on walnutbread from Skærtoft Mølle, which I share with you here: Valnøddebrød med speltmel. You can either use the dough for baking two large breads or approx. 16 buns. I used one part of the dough for making a bread for the cheese tapas. 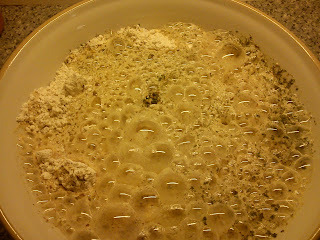 And the other part of the dough I used for baking buns for my freezer. This bread has also been a bit of a challenge for me ! Actual to be able to find all the right ingredients. Besides from the obvious ingredients like flour (spelt), yeast, salt, water and oil, I also needed to get hold of hazelnuts (easy task). 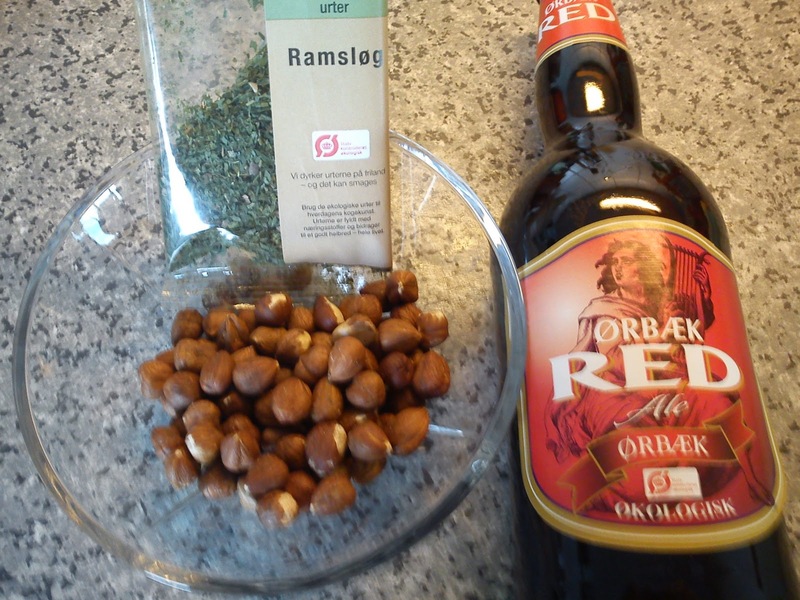 But these two ingredients ramson (wild herb growing in the forest during spring time or as dried herb in a shop) and a beer called Nutty Brown from Ørbæk brewery, were something of a challenge. I managed to find dried ramson after phoning the manufacturer of the herb and looking into more than 3 of the mentioned supermarkets. I believed, that to buy the mentioned beer in the recipe would be like a walk in the park !!! However, I decided to check the mentioned beer type with a brew master at work before going shopping Thursday afternoon. And am I glad, that I did that ??? YES !!!! Because Nutty Brown was impossible to buy in the supermarket. So based on the brew master's recommendation I brought an ale beer instead of from the same brewery called RED. An ale will have less rest sugar after brewing compared to a stout beer and therefore bring less sweetness. It is the first time, that I have used beer in bread making. 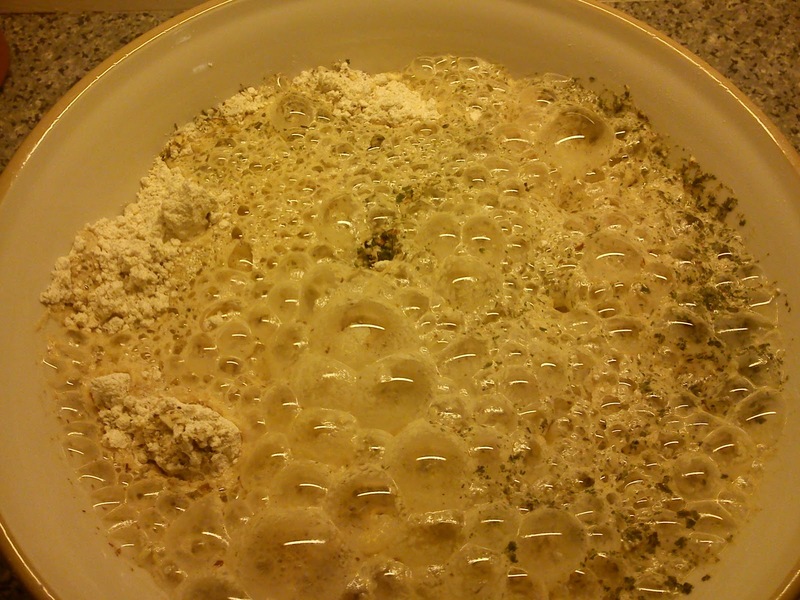 And it was quiet funny to see all the foam in the mixing bowl. In the recipe it is mentioned, that the grated hazelnuts should be added prior to kneading. This is last time, that I will do that !!!!! These grated hazelnuts kept popping out of the dough during kneading, so I had to vacuum clean the kitchen floor afterwards for pieces of hazelnuts. 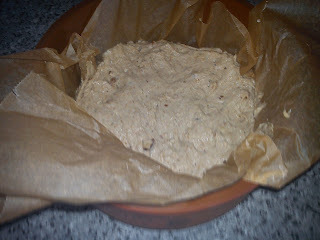 So another time I will first add the hazelnuts after kneading. I also decided to use baking paper in the clay form instead of oiling the form. 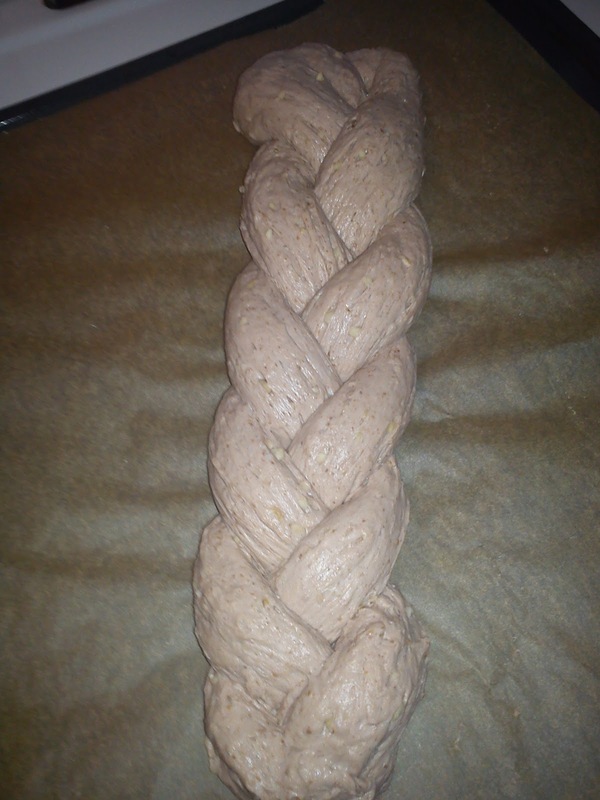 I clearly remember my difficulties in getting the Frederiksgård Frokostbrød out in one piece off the baking form. 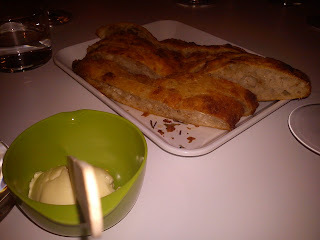 I will be making this bread again in the near future using fresh ramson. 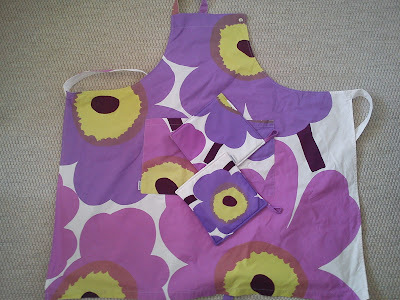 I am a big fan of the Marimekko flower either on towels, bed linen or kitchen equipment. I just like the positive feeling I get, while looking at these "naive" flowers. 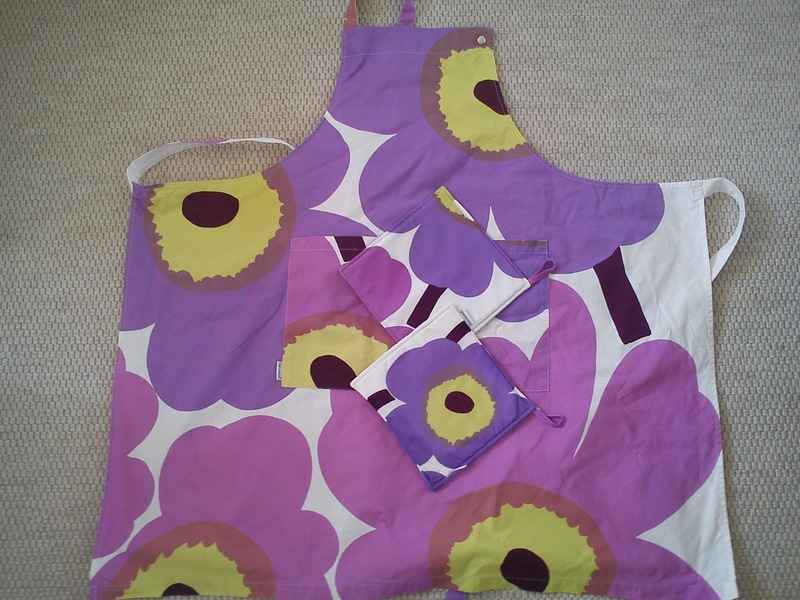 On one of my business trips to Finland I found this Marimekko apron and oven gloved with 50% discount at the Marimekko outlet store in the Helsinki﻿ area. The only available colour was purple, but this is NOT an issue for me as purple is my favourite colour incl. 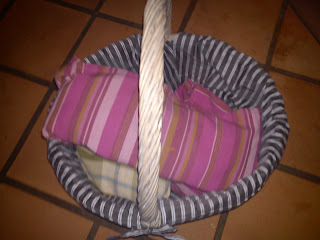 for cloths. Some of my work colleagues believe, that I only have purple cloth in the wardrobe !!!! I am looking forward to my next business trip to Helsinki, which is coming up soon. As you never know, that you will find of Marimekko thing in this outlet ???? "Gækkebrev" is very, very Danish tradition in connection with Easter. You can either buy a very nice colourful "gækkebrev" at the post office incl. the spring poem, so you only have to "sign" with letter with dots illustrating your name and send it to the receiver (see the picture above). 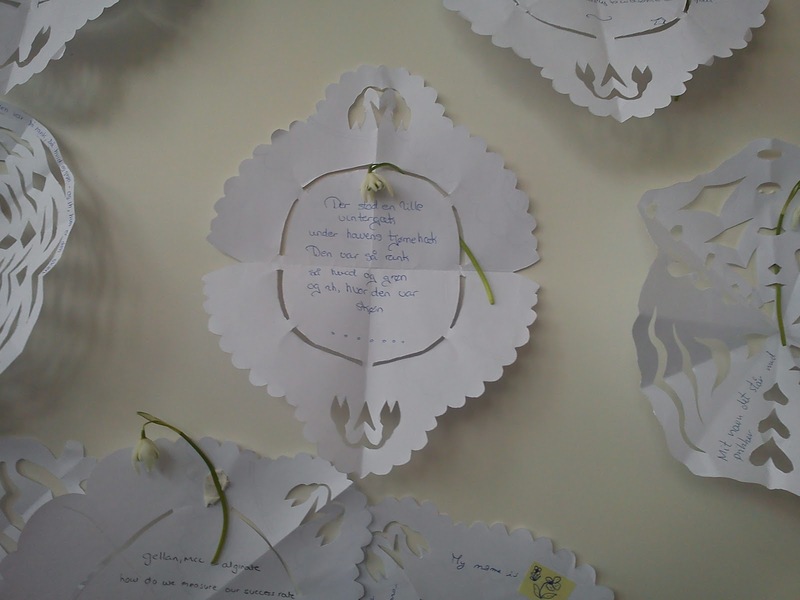 Or you create your own very letter in form of a paper cutting with a spring poem include a snow drop an again sign the letter with dots (see the picture below). 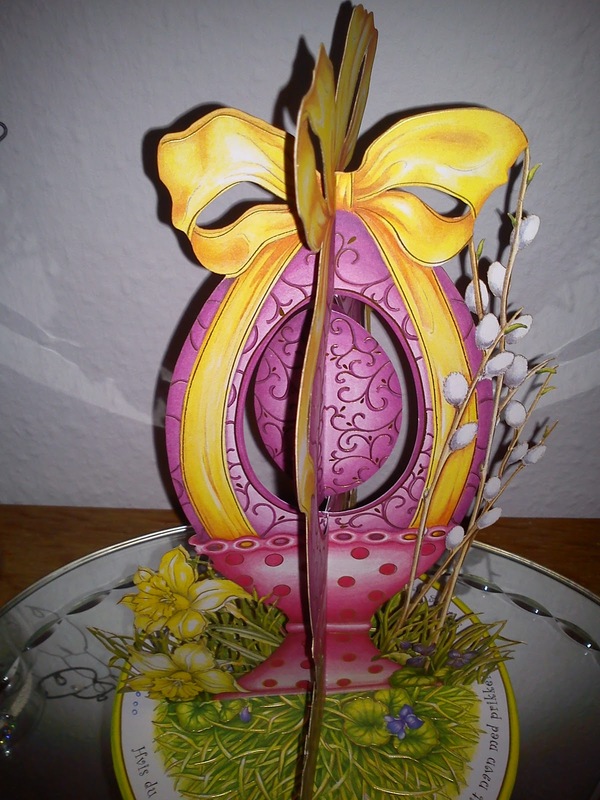 If you guess the sender of the letter, you will inform the sender about this, and therefore you are entitled to receive an Easter Egg, typical in form of a chocolate egg, in connection with Easter. 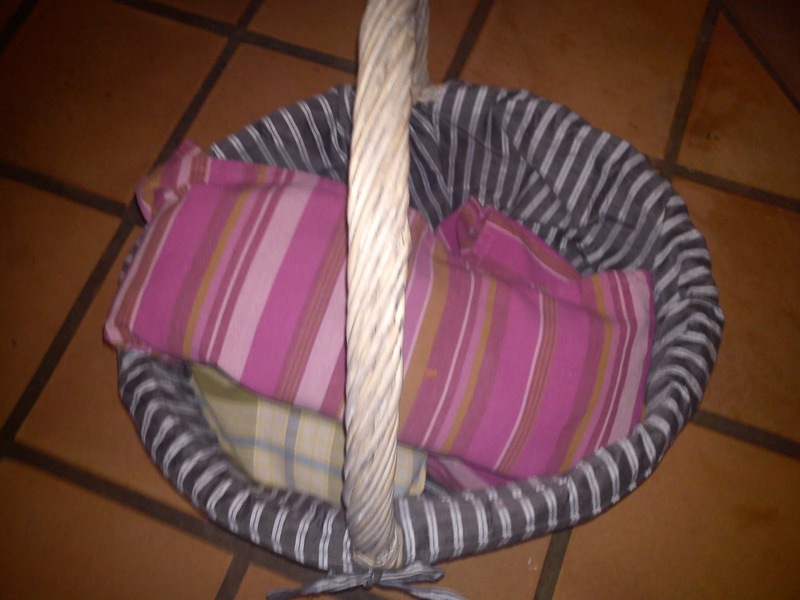 However, if you unable to identify the sender, you have to give the sender an Easter Egg. Thank you to all of you :-)) who participate in my vote about, which bread I should bake﻿ from my bread book "Hjemmebagt" for the cheese tapas tomorrow evening. The "winner" bread is Kokottebrød med ramsløg = "Kokette" bread made from spelt flour, beer, hazelnuts and ramson. 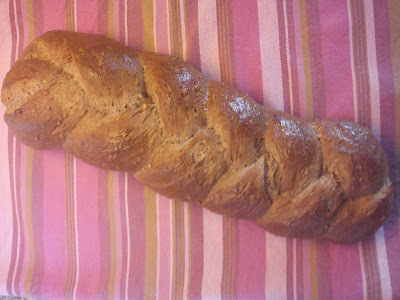 I will also bake another bread, which I keep as a secret until later on. So I have been busy make two dough this evening. And they are cold raising until tomorrow afternoon, where I will bake them. 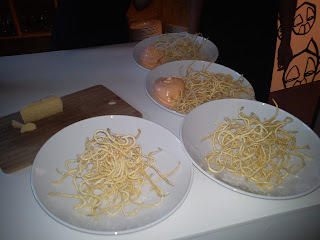 Hvilket brød skal jeg bage til ostetapas på fredag ? 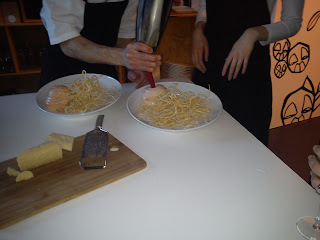 Hvilket brød synes du, at jeg skal bage til ostetapas med nogle rovenner på fredag ? 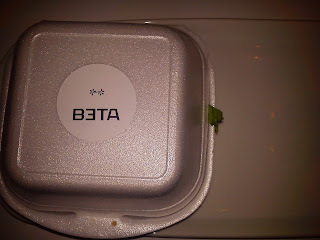 In connection with a company seminar last week with colleagues from both Denmark and various countries around the world, we were invited for dinner at Beta in Århus. Beta in doing private dining with focus on molecular gastronomy http://betabeta.dk/. The focus for this evening was on FAST FOOD !!!!!! 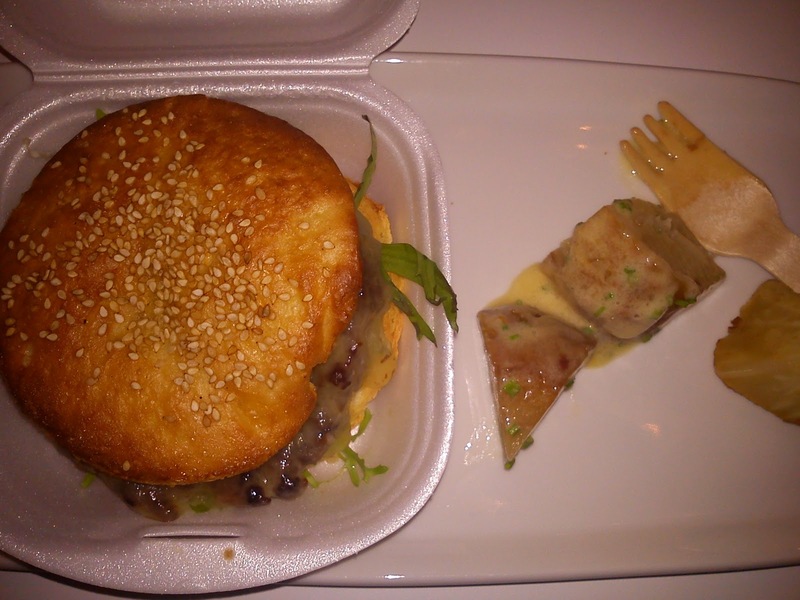 The second appetizer was a bread sandwich. 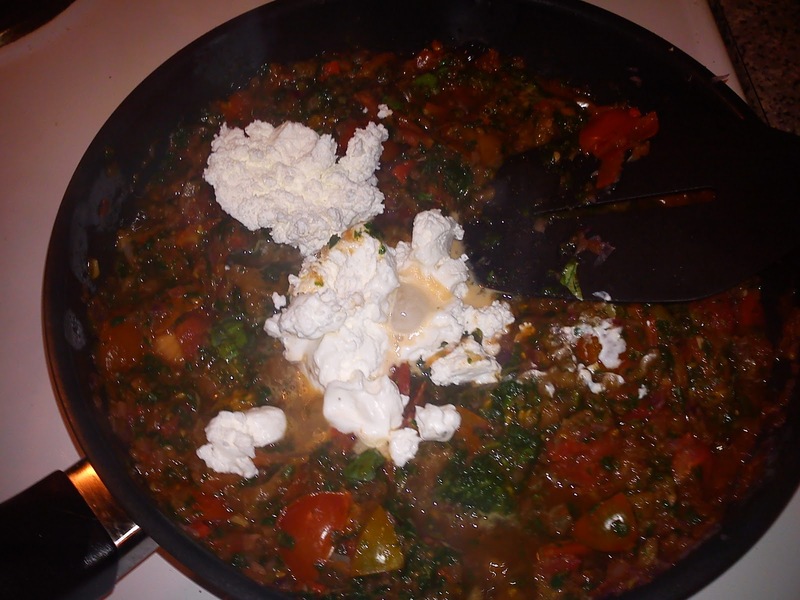 A mix of flour and egg was whipped, before it add on top of parsley. Afterwards it was "cooked" in a microwave oven. 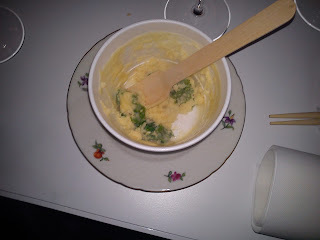 The taste reminded me about a typical cauliflower gratin. The starter was "fish & chips" served with mayonnaise. 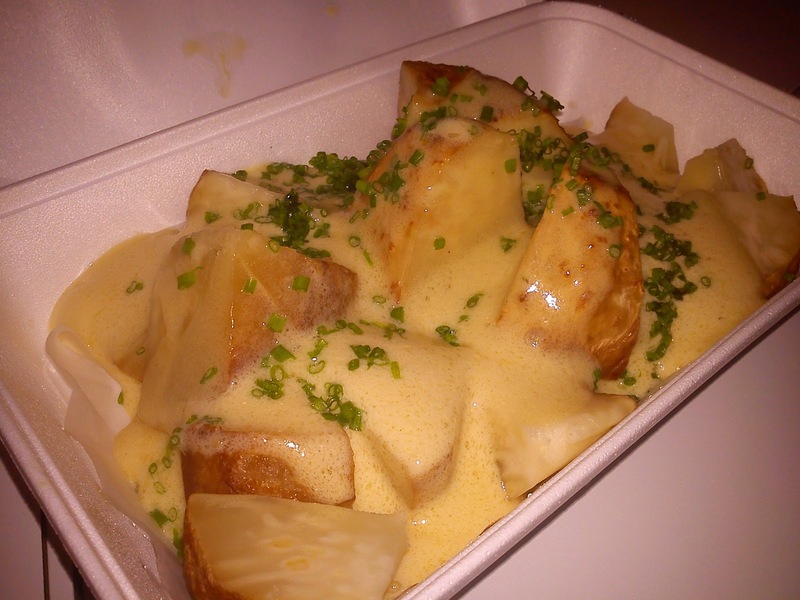 The "chips" was dried cod fish and the potato was cut in half before frying. When I saw, that the second starter would be served in a metal tin like the very traditional Danish markerel in tomato, I did not have high expectation !!!! 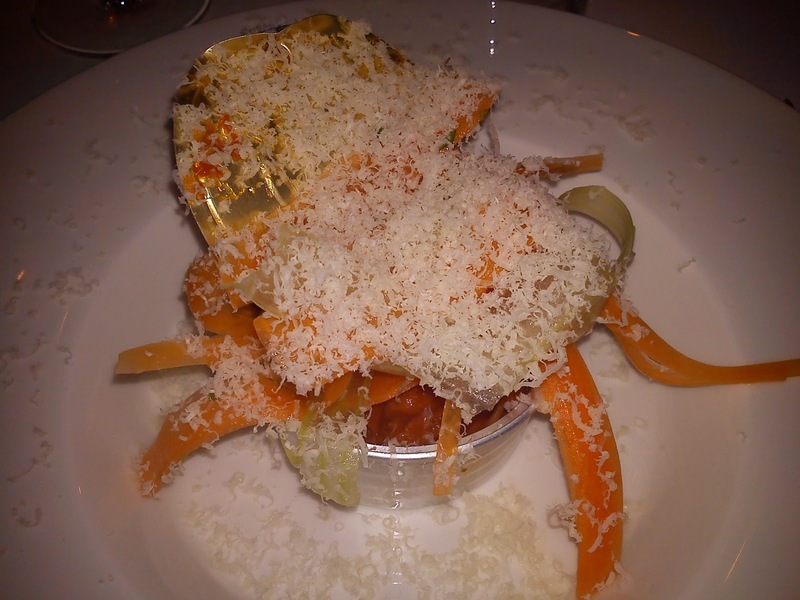 However, it turned out to be ravioli in thin sliced of squash and carrots with yet another "snow layer" of Parmesan cheese. 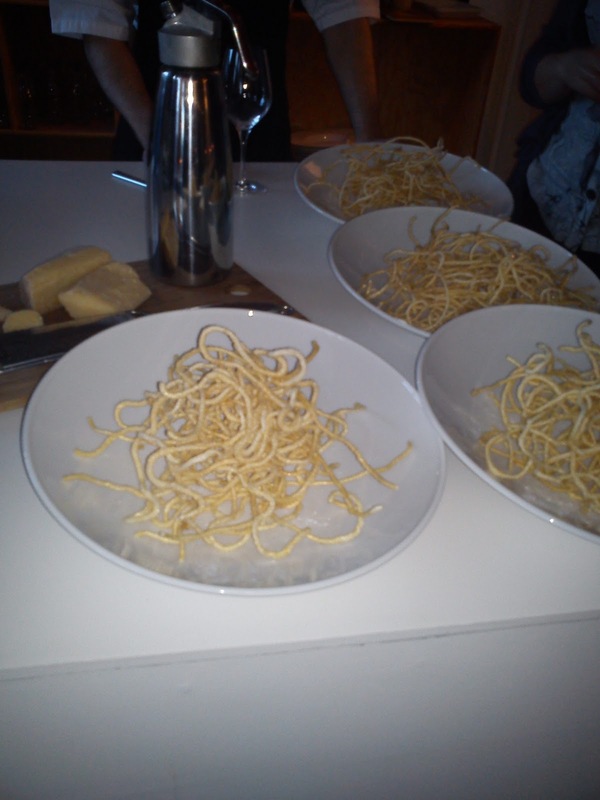 This second starter was a delight for the eye as well for the taste buds. The chips for the main course, not potato, but celery with hollandaise sauce. The main course was another fast/junk food classic = the cheese burger !!!!! 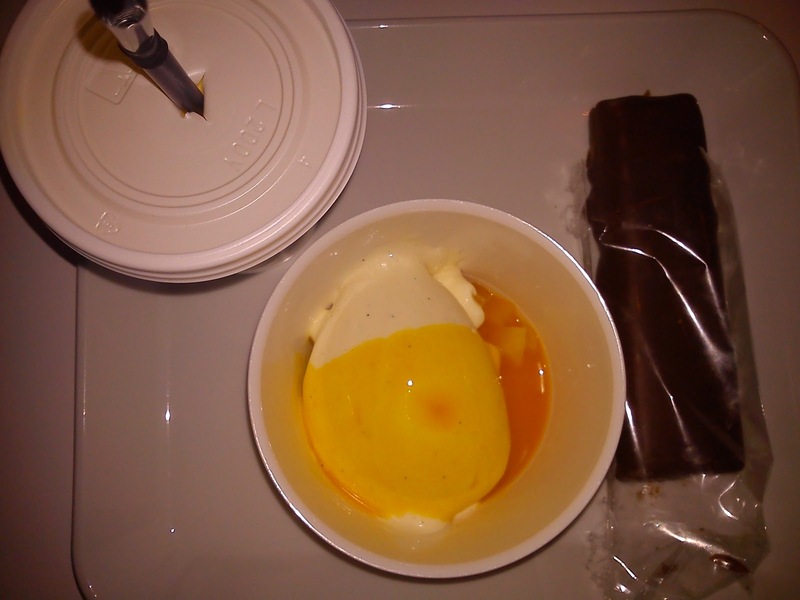 For dessert we got mango vanilla milk shake + vanilla sundae ice cream with mango + chocolate muesli bar. The milk shake and the ice cream were just perfect. The muesli bar was rich in flavour, but not on the same level taste wise as the mango desserts. Finally we were served tea (or coffee) with a soft toffee. 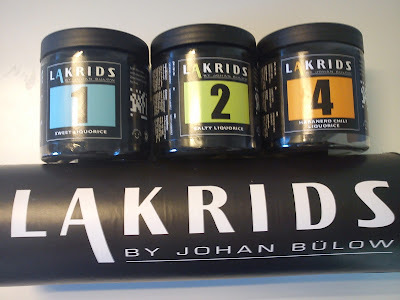 I remember the very, very first time, when I tasted the chili liquorice. 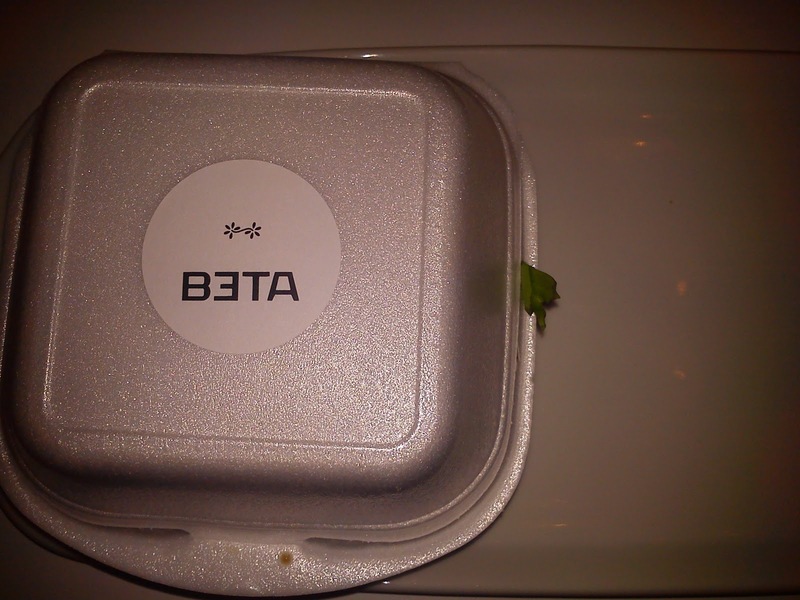 The first impression was, that it was sweet. But then the chili kicked in with a good burning sensation :-)) And now this chili liquorice is one of my favourite liquorice. 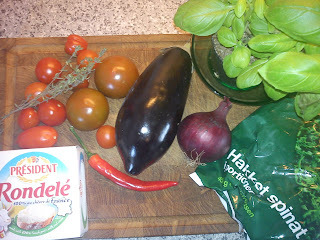 Egg plant is a regular guest in my weekly vegetable box﻿. 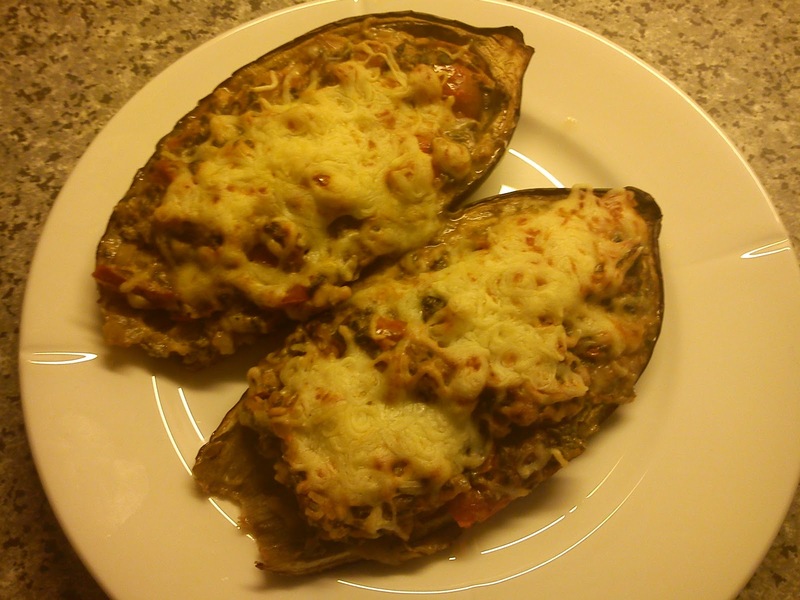 I am not a big fan of egg plant, however I have come across a recipe, which I have made certain adjustments to, and now I eat my egg plant with great pleasure :-)) And any leftovers I will put into the freezer for easy food on working days. 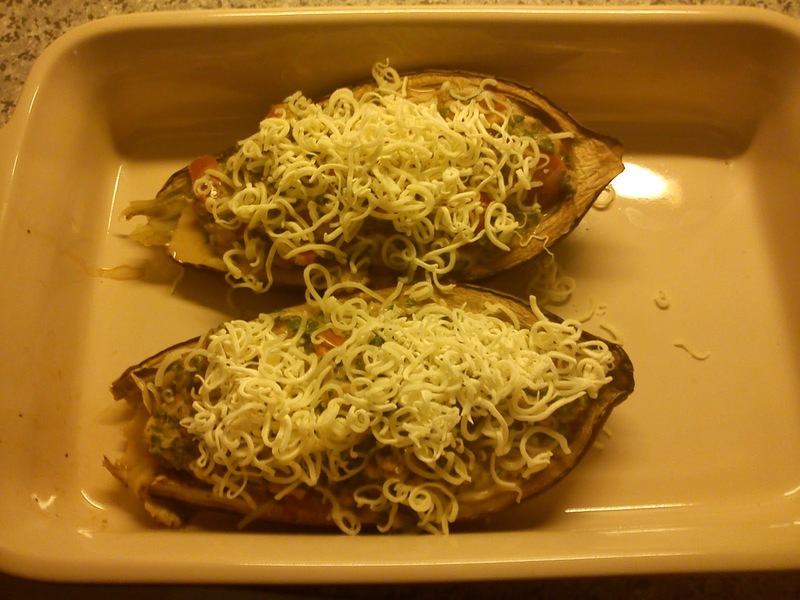 Cut the egg plant into halves and sprinkle them with salt. Let them salt for 1 hour. 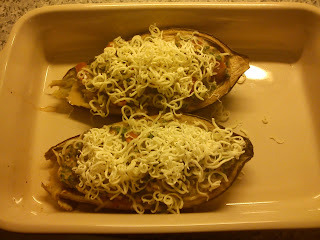 Bake the egg plant for 200'C for 15 minutes. Remove the "meat" from the egg plant and mince it. 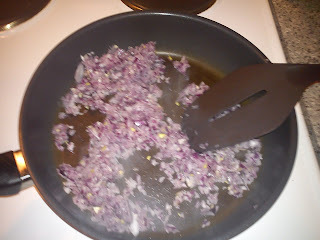 Fry the onion on a pan without using oil. Add the goat in the vegetable mix and stir until it is melted. 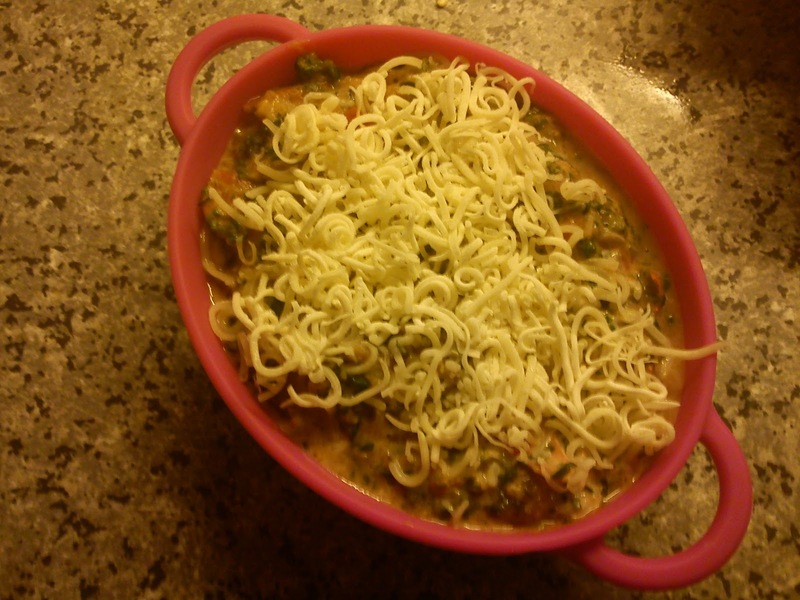 Fill the egg plan with this vegetable filling.